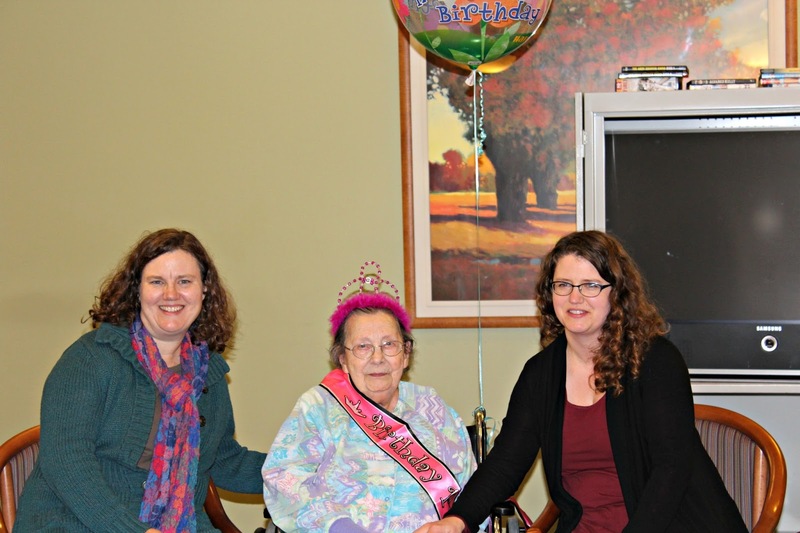 Even as a girl, I knew my grandma would become a centenarian. Today she turns 101 years old. Though she is not physically imposing, and Alzheimer's is taking a toll on her mind now, she has always been physically and mentally strong. It was impossible to imagine that she wouldn't make it to the 100 mark. Now she has done that, plus one year. When I was in high school, our family moved, and Grandma was the one who loaded up our 100-pound barrels of wheat. (I remember my dad coming out to move them and being surprised to find them already moved.) She was always doing things like that: trying cartwheels in her living room when she was in her 70's, to see if she remembered how; and attending water aerobics classes well into her 80's. Not only did she stay physically active, she also kept her mind busy. As a senior, she learned how to play the piano and use a computer. She lived through the Great Depression, moved from the Ozarks in Arkansas to the Central Valley in California, then finally settled in the Willamette Valley in Oregon. She worked hard, both in and out of the home, serving as a secretary to a state senator, and still managing the 100-acre farm with my grandpa. In the early 1950's, she checked out a book about electrical wiring from the library and then successfully wired the upstairs bedrooms in the farmhouse--thus providing light for my mom and my uncle. 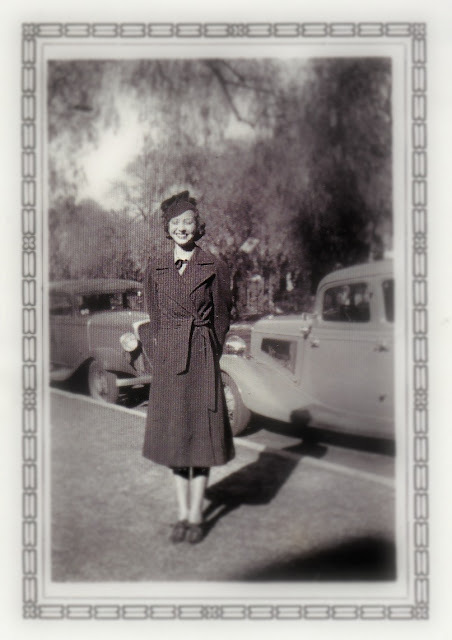 Photo: Grandma, wearing a coat and hat, smiles (with eyes closed) for the camera on her wedding day. In the background are two sedans, parked facing each other. Though (or maybe because) she kept busy and worked hard, she always wore a smile on her face. She is a gentle soul, and her kind heart belies her fierce determination to accomplish whatever task is ahead of her. Many people, both in and out of the family, have benefited from her service. She visited "old people" who were younger than she when they moved into nursing homes, and helped them not feel so lonely. She crocheted blankets--baby and full-size--for her grandchildren, great-grandchildren, and who knows how many other individuals. She did extensive family history work. She served in the church and was a temple worker. Her neighbors knew and loved her. 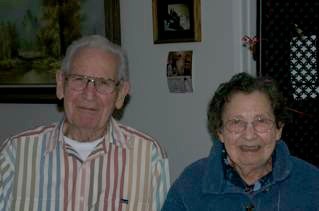 Photo: Grandma and her brother, Lucas, sit together in her house. They are both in their older years in this photo. A few years ago, when her house and many of her things were sold, the most prized possessions for buyers were those items on which she had carefully printed her name. Friends and neighbors wanted old Tupperware containers, not because they needed more plastic ware, but because they loved seeing her name on the bottom. Those containers (and other items) reminded them of her loving service. The individuals who purchased them had probably seen those items before, when Grandma had brought over dinner when her neighbors were sick, or had taken a potluck dish to the church party. She has given me a wonderful example of aging gracefully, which basically is this: Ignore the number of candles on the cake, do what needs to be done, don't be afraid to try new things, stay busy, and serve others. What are your memories of your grandparents or other relatives? Happy Birthday to your sweet grandmother! I knew only one of my grandparents (my maternal grandfather). He was a character. I wish I had asked him more questions. 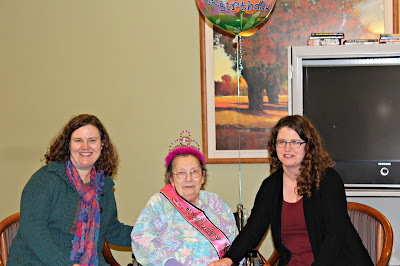 My aunt celebrated her 101st birthday in December 8th. Thank you. Happy birthday to your aunt. I remember from last year that your aunt and my grandma are the same age.